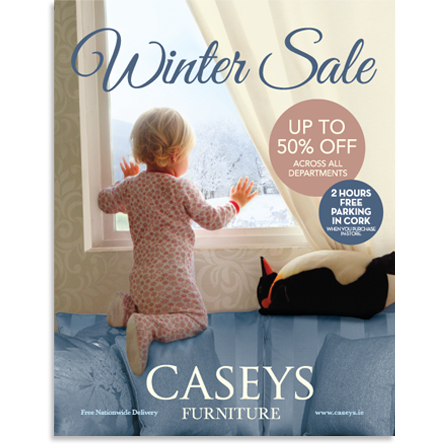 At the end of February 2012 CASEYS were looking to improve the return on their advertising spend and to reposition and refresh their advertising brochure to set themselves apart from other furniture stores. Greenhouse was challenged to design an advertising catalogue with a strong aspirational feel and Southern, their advertising agency, was tasked with sourcing an appropriate printed product. We were asked to come up with a printed product solution in co-operation with Greenhouse and Southern which would be in keeping with CASEYS high end furniture business. We offered a commercial quality 16 page magazine on high grade premium paper to compliment CASEYS market positioning as the furniture retailer of choice. 70gsm woodfree uncoated (103 brightness) fine-paper was selected on which to print the brochure as its bright, tactile quality was perfect for showcasing their superior furniture ranges. Distribution was through the leading paid-for and free-sheet newspapers in their stores’ catchment areas. Standard magazine (269mm x 340mm) was chosen as the product size to set it apart from other untrimmed or folded products on the market and to stand out from the carrying newspaper, as well as making it suitable for use as point of sale material. The brochure was editionalised by region to communicate the different features of each store and the products lines they carry. The colour schemes chosen, the bright, white, matt paper and the crisp, clean, glare-free reproduction set this catalogue apart. The combination of the high grade paper and finished size created a premium brochure to display CASEYS high-end furniture collections. 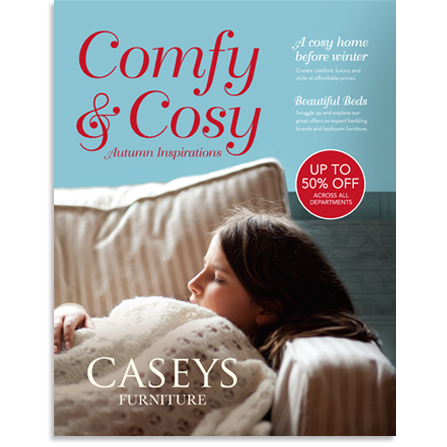 CASEYS sold 1 years’ worth of quality beds in the 6 weeks after the first issue appeared in early April 2012. Many readers contacted the newspapers carrying the brochure complementing the product and asking for more of the same. How often do readers ask for more advertising with their newspapers? In 2012 we printed 4 issues for CASEYS.